General Characteristics: Medium in height, moderately spreading, maturing within 12 to 15 months, producing from 2 to 5 oha; distinguished by the white petiole bases and the light reddish-brown petioles, indistinctly diffused with yellowish-green. Petiole: 60 to 85 cm. long, light reddish-brown indistinctly diffused with yellowish-green, purplish at apex, indistinctly red at edge, white at base. Leaf blade: 35 to 45 cm. long, 25 to 35 cm. wide, 25 to 40 cm. from tip to base of sinus, sagittate, dark green with bluish cast; piko purple; lobes acute with shallow, narrow sinus. Corm: Flesh chalky white with yellowish fibers; skin whitish. 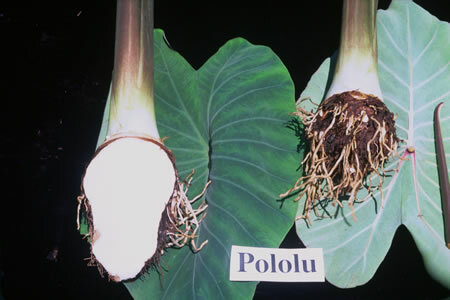 Origin, and derivation of name: Native variety; named, no doubt, after Pololu Valley in the Kohala district of Hawaii. Distribution: Grown to some extent in Kohala, Hawaii, under wetland culture, but seldom found elsewhere. Use: A fairly good poi taro.